10/1/09 A Grey Seal was bottling 50 metres offshore at Capstone Point SS519480 at 1353 hrs and was seen to surface again 300 metres to the west at 1422 hrs when a Harbour Porpoise was seen heading east 50metres off the Point. 11/1/09 A Grey Seal was bottling off Ilfracombe Pier SS525479 at 1312 hrs and later surfaced again 200 metres to the east. 15/1/09 A foot long Lumpsucker Cyclopterus lumpus, was landed alive by a Newquay fisherman and was presented to the Blue Reef Aquarium at Newquay. 1/2/09 A very rare Ribbonfish, also known as Oarfish, Regalecus glesne, was found washed up on the coast near Hauxley Northumberland NU280030. They can grow to 10 metres long and weigh over a quarter of a tonne, the longest bony fish in the sea. The Ribbonfish propels itself with a long undulating dorsal fin, which gives it a sea serpent type of motion. It is believed, that they were feared by mariners for many centuries, as a mystical sea serpent or monster. Only four have been caught or cast up on British shores in the last 50 years, for they are more at home in deep sub-tropical waters. for a dorsal, thought to be larger was seen a couple of times. 18/2/09 2 Bottlenose Dolphins were seen heading southeast off St. Ives SW520407 at 1700 hrs. They were in view for 30 minutes and appeared to be feeding. 20/2/09 3 Basking Sharks were seen slowly heading east together at the surface off Battery Rocks SW447297 during the morning. 24/2/09 2 Fin Whales were spotted 2 mile offshore at The Isles of Scilly SV9105 last week. They were resting, and one appeared to be sleeping as it was lolling about on the surface. 25/2/09 A rare Wrinkled Swimming Crab, Liocarcinus corrugatus, was found trapped in a prawn pot at 27 metres in the River Fal SW8334. It was taken alive to the Blue Reef Aquarium, Newquay. Last record for this species in Cornish waters was 1984, and only 11 have ever been recorded, nine of which were pre 1907. 28/2/09 A Grey Seal was seen 50 metres off Capstone Point SS519480 at 1503 hrs slowly heading east on the surface. 13/3/09 A Harbour Porpoise was seen 800 metres off Tunnels Beaches Ilfracombe SS524479 at 0840 hrs heading west. 14/3/09 At least 4 Bottlenose Dolphins were seen 400 metres off Gribba Head SW355302 at 1125 hrs. They were heading quite rapidly south. 15/3/09 2 Grey Seals were seen ½ mile off Kenidjack Castle SW355326 at 1408 hrs. 15/3/09 An Octopus was seen on the wreck of The Juan Ferrer, near Boscawen Point SW431229 on a morning dive. The body was about the size of a man’s fist. 15/3/09 4 Bottlenose Dolphins were being very active at the surface, breaching and tail walking etc, for 20 minutes from 1630 hrs, 300 metres off Trenow Cove SW531299 then made off out to sea. 17/3/09 A pod of 10 Bottlenose Dolphins went past the Gwennap Head NCI Lookout SW367215 very close in. 18/3/09 A pod of about 8 Bottlenose Dolphins was very playful around the passenger ferry The Duchess of Cornwall in The Carrick Roads, SW830328, when on her way from Falmouth to St Mawes in the afternoon. 29/3/09 2 Harbour Porpoises were SSE of Porthgwarra Cove SW371216 during the day. 29/3/09 3 Bottlenose Dolphins were breaching, rolling and tail slapping from 1800 to 1830 hrs just off the entrance to Penzance Harbour SW476303. Two were breaching together and the third may have been a calf as it was swimming very close to one of the larger animals. 14/4/09 A Basking Shark was seen off Kilcobben Cove SW716126, from 1400 to 1415 hrs. Only dorsal fin was visible circling and drifting slowly eastwards. 18/4/09 A pod of about a dozen Bottlenose Dolphins was breaching about 70 yards of the beach at Porthminster SW521401 at 0900 hrs. 19/4/09 A pod of about 8 Bottlenose Dolphin was playing near The Gear Pole in Mounts Bay at 1300 hrs and the small pod of three, Cookies, pod, was in the area also. 24/4/09 A pod of 6 to 10 Common Dolphins was seen heading east off Porthgwarra SW371216 at 1500 hrs. Another pod of 10 to 15 headed east at 1535 hrs with a smaller pod heading west closer inshore. These may have been the first pod seen at 1500 hrs. 25/4/09 A pod of 8 dolphins, including 2 juveniles, was seen heading east off St. Ives SW520407 at 0845 hrs. They were seen again in the same position at 0930 hrs heading in the opposite direction, milling, feeding and breaching. Gulls and Cormorants on the surface. 26/4/09 2 dolphins were breaching close to the beach at Gyllyngvase SW808316 at 1930 hrs. 29/4/09 2 Basking Sharks were seen off Porthgwarra SW371216 between 1030 and 1100 hrs. 29/4/09 A Harbour Porpoise was seen heading north 200 metres off Capstone Point SS519480 at 1805 hrs and a Grey Seal was bottling 100 metres NW of the Point at 1807 hrs. 30/4/09 A rare fish, Salema, Sarpa salpa, was caught south of the Eddystone Reef SX3839 by the Looe Trawler, Guiding Light. This is the 3 British Specimen. They are usually found in shallow coastal water in the Mediterranean and along the African coast. 4/5/09 A Basking Shark was seen by a fisherman, 2 miles off Pendennis Point SW826315 at 1030hrs. 9/5/09 2 Risso's Dolphins were spotted from Scillonian III just east of St. Clements Isle SW474261 at 1900 hrs. 10/5/09 A Risso's Dolphin was seen half way between The Runnelstone SW369200 and the Wolf Rock Lighthouse SW270120 at 1430 hrs. Seen from a yacht taking part in a race. 18/5/09 Thousands of By-the-wind-Sailors, Velella velella were being washed up on the beach at Praa Sands SW5728 during the evening, brought in by the prevailing southwest wind. They varied in size from 4.5mm to 7 or 8 cm all laid up in rows on the beach graded in size by the wind, waves and topography with largest at the bottom. Also found on the beach was a perfect Cuckoo Ray egg case. 19/5/09 3 Harbour Porpoises were 75 metres off Capstone Point SS519480 at 1621 hrs with 2 gannets in the area. 20/5/09 100s of By-the-wind-Sailors, Velella velella were found washed up at Kynance Cove SW685132, all different sizes. 20/5/09 Thousands of By-the-wind-Sailors, Velella velella, were found washed up between Stoke Point and Netton Island SX555459 at 1800 hrs. All appeared to be dead. There were 2 groups of sizes, 4 to 6 mm, and 10 to 15 mm. 20/5/09 A Harbour Porpoise was off Tunnels Beaches Ilfracombe SS524479 at 0738 hrs with 3 gannets in the area. 21/5/09 10s or even hundreds of thousands of By-the-wind-Sailors, Velella Velella were washing up on Par Beach SX0853. Only a few were large, most of them were quite small, from 6 to 10 mm. Also found were a couple of what was thought to be Haminoea Sea Slugs. 25/5/09 A 20ft Basking Shark was seen 60 metres off Charlestown Harbour SX039515 at 1100 hrs. 29/5/09 2 Basking Sharks were seen below the Minack Cliff Theatre SW387220 at 1013 hrs. They circled for 15 minutes then headed west. 30/5/09 2 Bottlenose Dolphins were seen off Porth Nanven SW355309 at 1900 hrs. 1/6/09 29 Basking Sharks were seen off Gwennap Head SW367215 in the morning. 2/6/09 2 Basking Sharks were seen feeding off Pendeen SW377358 at 1500 hrs. One was 10 to 12ft long with a juvenile 6 to 8ft long, keeping very close together. 2/6/09 A Leatherback Turtle was seen off Porthgwarra SW371216. 3/6/09 2 Basking Sharks were seen feeding outside the Breakwater in Plymouth Sound at 1236 hrs They were about 30 metres apart heading west. 6/6/09 A Mako Shark leapt out of the water and tore through a fisherman’s catch of mackerel 1½ mile off Helford Point SW759264. The fisherman who has in the past caught over 8000 sharks, including 10 Makos in British waters, said it was about 13ft long and 350 to 400 lbs in weight. 8/6/09 A large Basking Shark was seen by a helicopter pilot aboard a German Frigate southwest of Salcombe SX7338 in position 50º8.41N 03º53.99W at 1830 hrs. It was observed feeding for about 6 minutes. 10/6/09 A Basking Shark was seen to breach off Botallack Head SW361338. 12/6/09 A Moray Eel was caught 60 miles off Newlyn by Beam Trawler Trevessa and later sold at Newlyn Market. SW462285. This is only the 10th Moray caught in British and Irish waters. This was a North Atlantic warm water fish at the northern limit of its range. 12/6/09 A boat sailing from Ilfracombe SS525470 to Land’s End SW341253 was joined by a pod of about 40 Common Dolphins in Bideford Bay SS4333. They disappeared before reaching Hartland Point SS230279 but reappeared later and spent the next 7 hours following the boat along the north Cornwall coast, When they were about 8 miles of Padstow next morning 12 Basking Sharks were seen. There were 5 adults, 5 juveniles and two very small ones. 13/6/09 Four 6 metre Basking Sharks were off Sennen Beach SW350263 at 1400 hrs. Circling and feeding in pairs. 13/6/09 7 Basking Sharks were seen off Carn Glose SW354313 from 1530 to 1730 hrs. 5 were close in, 50 to 100metres offshore, one of which was a 10 metre shark. Two others were very close, touching each other, and rolling over and under each other, perhaps mating. Two others were out in the tide race near the Brisons. 13/6/09 A metre long Ocean Sunfish was seen 200 to 300 metres southeast of St Michael’s Mount SW504298. The first report received this year for this species. 13/6/09 A 25ft Basking Shark was seen at Gunwalloe Cove SW661204 at 1200 hrs 14/6/09 3 Basking Sharks were circling and feeding off Praa Sands SW5728 at 1430 hrsThey were just off the beach with 2 surfers very close. 15/6/09 2 Basking Sharks were close in at the western end of The Tribben, Sennen SW349265 during the afternoon. 18/6/09 A pod of dolphins was seen moving fast pursuing prey about 1 Mile south of St. Anthony Head SW846311, followed by Gannets, Cormorants and Kittiwakes. Some 400 metres from the observer the birds started diving for about 10 minutes and the dolphins remained in the area before again heading west. 18/6/09 6 Basking Sharks were seen off Mullion Cove SW666178 at 0830 hrs. 4 were circling to the north of the island and two were to the west of the island. 21/6/09 2 Basking Sharks were seen feeding off Maen Dower SW356294 for about 20 minutes, then one headed northwest and the other south. 22/6/09 2 Grey Seals, a male and a female were seen in Lantivet Bay SX1650 at 1100 hrs There was some interactivity between the two. A boat approached rather close causing concern by the observer. 23/6/09 11 Grey Seals were hauled out basking on the rocks at Black Rock, Falmouth, SW833317 at 1402 hrs. 25/6/09 An 8 metre Basking Shark was seen heading away from the coast off Gara Point SX522469 at 1300 hrs. 25/6/09 2 Harbour Porpoises were feeding, and breached twice, 500 metres off Capstone Point SW519480 with 5 gannets diving. 27/6/09 A 3 metre Basking Shark was seen feeding off Lamorna Cove SW541241 at 0800 hrs. 30/6/09 A pod of 12 Common Dolphins, including two juveniles, was seen south of Lantivet Bay SX1650 in position 50º5.25N 4º33.6W at 1010 hrs. A pod of about 12 was seen later in the day at 1402 hrs in position 50º5.51N 4º32.39W. this was thought to be the same pod seen in the morning. 1/7/09 A Grey Seal was seen heading west on the surface occasionally diving off Wildersmouth Beach Ilfracombe SS518480 at 0735 hrs. 4/7/09 An Ocean Sunfish was seen by anglers off Berry Head SX948567. It was heading east on the surface at 1130hrs. 4/7/09 A pod of about 10 dolphins, including a young one, was playing around a boat heading west in Fal Bay SW8028 at 1212hrs. 8/7/09 A small pod of Common Dolphins was bow riding MV Scillonian III as she approached Penzance Harbour SW476303 at 1930 hrs. 9/7/09 12 dolphins, probably Bottlenose Dolphins, were breaching frequently off Porthcurno SW387222 at midday and probably the same pod was seen breaching in Sennen Bay SW3627 during the afternoon. 10/7/09 10 Grey Seals were hauled out on rocks at Godrevy Island SW576435 but sadly disturbed 3 times with an hour by kayakers. 10/7/09 7 Basking Sharks were feeding off The Stones SW559270 all day. There were various sizes, some very big. 10/7/09 Strands of Pearl Chain, Apolemia uvaria, have been seen at Porthkerris Cove SW806226 over the past two days. Some strands up to a metre long. 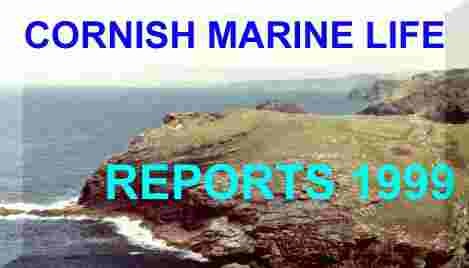 15/7/09 The Seawatch team at Gwennap Head SW367215, reported seeing 2 to 5 Harbour Porpoises, one or two Grey Seals, and an Ocean Sunfish today. 15/7/09 4 Basking Shark were seen close in below the watch at the NCI Lookout at Cape Cornwall SW349318 at 1057 hrs. They stayed a while, then all headed south. 18/7/09 6 or more Basking Sharks, 3 Risso's Dolphins, a Harbour Porpoise and 3 Grey Seals were seen off Gwennap Head SW367215 by the Seawatch SW team today. 19/7/09 4 Grey Seals were seen off Gwennap Head SW367215 by the Seawatch team today. 20/7/09 2 or 3 Basking Sharks, 3 or more Bottlenose Dolphins, 4 Harbour Porpoises, an Ocean Sunfish and 5 or more Grey Seals were seen off Gwennap Head SW367215 today by the Seawatch team. 20/7/09 An Ocean Sunfish was seen the landward side of Godrevy Island SW SW576435 at 1030 hrs. 21/7/09 4 or 5 Grey Seals were seen at Gwennap Head SW367215 during the day. 21/7/09 2 dolphins, thought to be Risso's Dolphin, were seen off St. Loy Cove SW424230. Adult with juvenile. 22/7/09 3 or 4 Grey Seals were seen off Gwennap Head by the Seawatch Team. One was eating a very large Grey Mullet. 23/7/09 A small pod of about 6 Bottlenose Dolphin was seen moving fast off Nare Head SW801251 early in the morning. 24/7/09 2 to 5 Harbour Porpoises, 2 dolphins in the distance, could have been Bottlenose Dolphin or Risso's Dolphin, 4 or more Grey Seals, and an Ocean Sunfish were seen off Gwennap Head SW367215 by the Seawatch team today. 25/7/09 5 Basking Sharks were seen between Lundy Island SS1345 and Hartland Point SS230229 , ranging in size from a baby to 9 metres. 26/7/09 8 Grey Seals were seen off Gwennap Head SW367215 today by The Seawatch team. 29/7/09 1 Harbour Porpoise and 2 Grey Seals were seen off Gwennap Head SW367215 by the Seawatch team today. 30/7/09 8 or more Common Dolphins, 3 to 10 Harbour Porpoises and 4 or more Grey Seals were seen off Gwennap Head SW367215 by the Seawatch team today. 31/7/09 2 or 3 Common Dolphins, 4 to 8 Harbour Porpoises and 3 or more Grey Seals were seen off Gwennap Head SW367215 today by the Seawatch team. 1/8/09 A turtle was seen heading seaward off Mexico Towans SW559389 at 1815 hrs. Described as having stripes on the back so probably a Leatherback Turtle. 2/8/09 A pod of 12 Whitebeaked Dolphins, including 4 juveniles, was playing around and bow riding a boat for 15 mins. 4 miles southeast of Fowey SX120510 at 1230 hrs. One adult had a white scar from damage on its dorsal fin. A young lad on the boat named it Raggy, and it could be a good pod identifier in future. 2/8/09 1 Basking Shark, 2 Bottlenose Dolphins, 4 Harbour Porpoises and 8 Grey Seals were seen off Gwennap Head SW367215 today by the Seawatch team. 4/8/09 A pod of about 9 Bottlenose Dolphins was seen off Lushington Beach SW694489 at 2030 hrs. They were breaching and surfing in the waves and then they headed northwest for a couple of miles but returned to the same area shortly after. 7/8/09 5 Harbour Porpoises, an Ocean Sunfish and 12 Grey Seals, were seen off Gwennap Head SW367215 today by the Seawatch Team. 8/8/09 2 Harbour Porpoises were 1.5 Km off Carn Gloose SW354313 at 1500 hrs heading south. 8/8/09 3 Harbour Porpoises were seen off Lowland Point SW804196 at 1212 hrs. 8/8/09 A Basking Shark, 8 Harbour Porpoises, an Ocean Sunfish and several Grey Seals were seen off Gwennap Head SW367215 today by the Seawatch team. 8/8/09 A 4 metre Basking Shark was seen heading southeast off Gull Rock Veryan Bay SW927368 at 1600 hrs, from a sail boat. 9/8/09 4 Harbour Porpoises were seen off Black Head SW779160 at 1503 hrs. 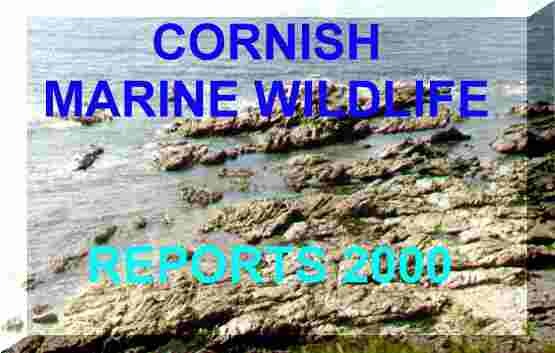 9/8/09 7 Harbour Porpoises, an Ocean Sunfish and 5 Grey Seals were seen off Gwennap Head SW367215 by the Seawatch team. 9/8/09 2 Harbour Porpoises were seen 500 metres NW of Cape Cornwall SW349318 at 1550 hrs. They were joined by and adult with a juvenile and moved off south at 1605 hrs. 15/8/09 A pod of 5 to 7 Common Dolphins came from the east, but went back east, 600 metres SSE of Porthgwarra Cove SW371216 at 1430 hrs. A similar sized pod came from the west at 1500 hrs, possibly the same pod. 19/8/09 A 3 metre Basking Shark was seen moving to and fro off the beach at Rinsey Cove SW593269 at 1215 hrs. When it came within 15 metres of the surf, 10 people left the water. 19/8/09 7 Bottlenose Dolphins were seen briefly off Godrevy SW581433 at 1600 hrs. 20/8/09 3 Harbour Porpoises with calves were seen 10 metres off Capstone Point SS519480 at 0808 hrs, and 2 were seen 400 metres off at 1400 hrs, and two more with calves were seen 200 metres off at 1800 hrs. 21/8/09 A pod of 6 to 20 Common Dolphins was seen in rough seas off Porthgwarra Cove SW371216. They came from 3 Km SSE to within 1 Km, heading east beneath gannets from 1805 to 1820 hrs. 22/8/09 6 Common Dolphins and 15 Grey Seals were seen off Gwennap Head SW367215 today by the Seawatch team. 28/8/09 A large Piranha was found in a Devon River. 29/8/09 12 Basking Sharks, 25 or more Common Dolphins, a Bottlenose Dolphin, an Ocean Sunfish, and 7 Grey Seals were seen off Gwennap Head SW367215 today by the Seawatch team. 30/8/09 5 Basking Sharks and 3 Grey Seals were seen off Gwennap Head SW367215 today by the Seawatch team. 31/8/09 5 Basking Sharks and 2 Grey Seals were seen off Gwennap Head SW367215 today by the Seawatch team. 31/8/09 A Basking Shark was seen in fresh winds in Sennen Bay SW350263 today. 31/8/09 A Basking Shark was seen off Levant Mine SW370344 by a birdwatcher during the day. 1/9/09 Harbour Porpoises were seen off Capstone Point SS519480 early morning, just after lunch and again in the evening, with much gannet activity. 3/9/09 4 Grey Seals were hauled out on Black Rock Falmouth SW834317 this morning. 13/9/09 At least one Basking Shark, 2 or more Minke Whales, 20 or more Common Dolphins, 4 Harbour Porpoises and 4 Grey Seals were seen off Gwennap Head SW367215 today by the Seawatch team. 14/9/09 6 Harbour Porpoises and 7 Grey Seals were seen off Gwennap Head SW367215 today by the Seawatch team. 17/9/09 A small pod of 2 to 5 cetaceans, probably Harbour Porpoises, were beneath gannets 5km west of Gwennap Head SW367215 late afternoon. 19/9/09 50 or more Bottlenose Dolphins were seen about 2 miles south of the Wolf Rock Lighthouse SW270120 at 1200 hrs. 3 were seen at first breaching, and the about 60 metres away about 50 appeared all breaching. 19/9/09 2 Harbour Porpoises were 2.5km northwest of Gwennap Head Sw367215 at 1130 hrs and 2 more were 3km west-south-west of the Head at 1205hrs. 20/9/09 A Basking Shark, a pod of about 20 Common Dolphins and 24 Grey Seals were seen off Gwennap Head SW367215 today by the Seawatch team, and they also reported 8 Grey Seals on the Longships Reef SW320253. 20/9/09 A large cetacean, at least 20 ft long, surfaced 3 times in about 20 minutes between Pentewan and Black Head in position SX033473. It was thought to be a Northern Bottlenose Whale. 22/9/09 A dead Northern Bottlenose Whale was found on the beach at Alum Chine near Bournemouth Dorset, SZ100910 It had been seen offshore from 14th to 18th of the month but discovered dead today. 25/9/09 3 Minke Whales were off the Wolf Rock Lighthouse SW270120. Two were south of the reef and a larger one was to the north. 28/9/09 A pod of at least 6 Bottlenose Dolphin including one juvenile, was seen heading south off Cape Cornwall, SW349318 at 0945 hrs. They spent some minutes near a small fishing boat near the Brisons when the juvenile breached a few times. 29/9/09 A Bottlenose Dolphin, 6 or more Harbour Porpoises and 9 Grey Seals were seen off Gwennap Head SW367215 by the Seawatch team today. 2/10/09 4 or more Harbour Porpoises were seen feeding beneath gannets off Porthcurno SW387222 and a Minke Whale surfaced twice as it was seen heading east. 8/10/09 A Minke Whale was seen off Porthgwarra SW371216 today. 12/10/09 One or two Basking Sharks, a Minke Whale, 2 to 5 Risso's Dolphins, a Harbour Porpoise and 3 Grey Seals were seen off Gwennap Head SW367215 today by the Seawatch team. 12/10/09 2 Risso's Dolphins, both large, one very pale, were seen off Gwennap Head SW367215 from 1445 to 1530 hrs. They were close to small fishing boats but not bothered by them. 13/10/09 Bottlenose Dolphins in two groups which came together to form a pod of about 10 were seen heading east between Godrevy Point and the Island SW578434 at 1400 hrs They were breaching, playing and tail wagging with their heads in the water. 14/10/09 3 Risso's Dolphins, one or two Harbour Porpoises, and 6 or more Grey Seals were seen off Gwennap Head SW367215 by the Seawatch team today. 14/10/09 2 Common Dolphins were seen ¾ mile off Nare Point Helford SW800252 from 1214 to 1216 hrs and two other dolphins were spotted further offshore from 1217 to1219 hrs. 14/10/09 5 Harbour Porpoises, including one juvenile, were seen steadily heading south off Gribba Point SW355302 at 1530 hrs. They were apparently feeding 500 to 700 metres offshore. 15/10/09 Two Risso's Dolphins, one seen side-slapping several times, and 8 Grey Seals were seen off Gwennap Head SW367215 today by the Seawatch team. 16/10/09 A 30 ft Basking Shark was spotted below the cliffs from an aircraft in Port Quin Bay SW9680 at 1130 hrs. 17/10/09 3 Harbour Porpoises were seen heading southwest at 1718 hrs from MV Scillonian III in Crow Sound Isles of Scilly SV940120 and 2 were seen east of Menawethen SV957137. East of the Eastern Isles SV980160, 3 Common Dolphins were breaching , trying the catch the bow wave of the Scillonian. 17/10/09 3 Common Dolphins were seen heading south off the Eastern Isles I.o.S SV980160 at 1720 hrs and 2 Harbour Porpoise were seen south of Lands End SW341243 at 1805 hrs. 14/11/09 A Grey Seal was seen off Porthgwidden Beach SW521410 at 1212 hrs. 16/11/09 8 Grey Seal pups were found dead within a 6 day period at the beginning of the month. High tides and stormy seas have caused pups to be swept out of coves, caves an other breeding areas. Others have been taken to the Gweek Seal Sanctuary after being separated from their mothers. Staff there are working to make the pups feel calm and ensure that they are fed and well looked after. 18/11/09 A pod of dolphins was seen heading west off the NCI lookout St Ives SW521411 at 0834 hrs and returning heading east at 0850 hrs. 23/11/09 3 dolphins, thought to be Bottlenose Dolphins, were seen heading north off Cape Cornwall SW349318 at 0930 hrs. and a Harbour Porpoise was briefly seen 700 metres off the Cape at 1100 hrs. 27/11/09 A Harbour Porpoise was seen behind The Wra SW381365 at 1005 hrs. 9/12/09 10s of thousands of Starfish stranded at Holkham Beach Norfolk TF8946 earlier this month. 25/12/09 A pod of 5 to 7 Bottlenose Dolphins was seen heading southwest near the Longships Reef SW320253 from 1307 to 1311 hrs. 28/12/09 A dead Triggerfish was found stranded at Woolacombe Beach SS450420 and two more were found stranded on the tide line at Watergate Bay SW842655. Triggerfish seem to get stranded regularly on the Cornish coast at this time of year, from December to February, and some of them are quite small, so are they breeding this far north?